For some reason it seems like pub.darlang.org ignores the package analysis_options and uses its own rules, which is regression from what we had before. package:pana and the pub site does use rule replacement, and we are doing it from the very beginning. This is to enforce a minimum/common set of rules, and not to rely on the ones that the package author provided. We also update the rules from time-to-time, following the toolset defaults. Last week we've released a new version of pub site that used the updated rules, that's why you see the change. As the recommended defaults change over time, pana and pub site will follow it, and it could result in changes in the analysis results. You can introduce a non-breaking migration path: renaming the fields to lowerCamelCase, and keeping a getter for the CamelCase versions. You can use ignore rules to ignore a specific rule, clearing it for now, but hopefully addressing it later. @isoos I see, thanks for the info and the suggestions. I will amend as per your recommendations. Does pub publish also check according to these rules? Sorry for the confusion @Sh1d0w. This is exactly what we're trying to head-off in the long-run. 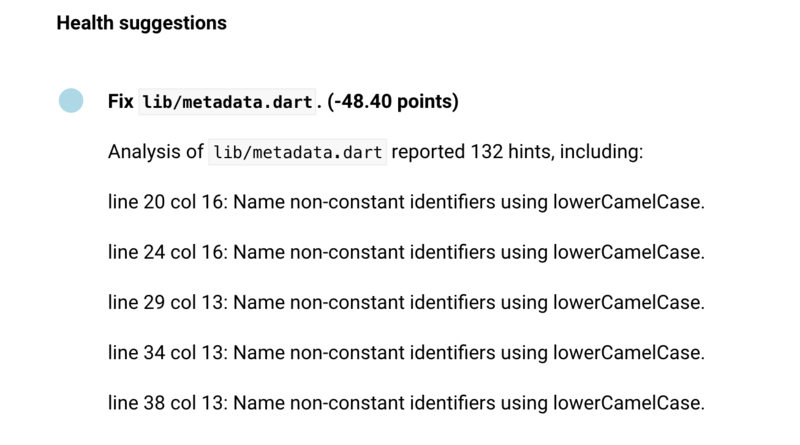 I've added a few notes to dart-lang/linter#1365 with documentation ideas but this is really helpful context. Cheers!